Depending on the sample temperature setpoint, a heating element builds up a specified pressure in the liquid nitrogen dewar in order to create a highly constant nitrogen gas flow. The pressure and temperature in the dewar are measured by two channels of the Quatro controller. 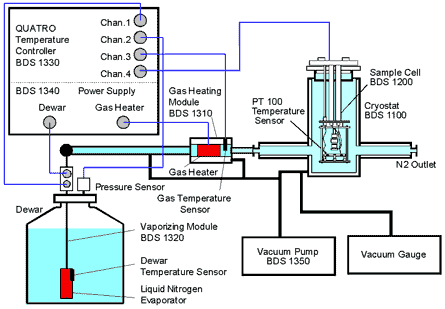 After heated by a gas jet, the nitrogen gas flows directly through the sample cell that is mounted in a cryostat. The gas and sample temperature are measured by the two remaining channels of the QUATRO controller. The four channel arrangement allows very stable, fast and save system operation in combination with low liquid nitrogen consumption (economical mode). 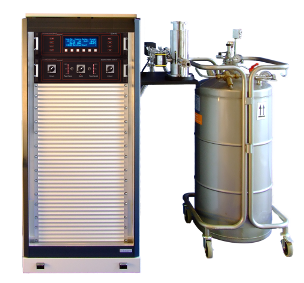 The cryostat is vacuum isolated by a 2 stage rotary vane vacuum pump, providing thermal isolation by low vacuum (< 10 µbar). All temperature experiments are supported by the software package WinDETA providing both isothermal control and temperature ramping.